Did you know your garden is hiding all sorts of nutritional and medicinal gems? From curing heartburn, cystitis and coughs to providing free protein, vitamins and minerals, common weeds have some truly amazing benefits. Sadly, most people simply dig them up, mow them down or kill them in various ways. Why not take a look at what’s really growing in your backyard? This garden weed is a great source of vitamins A, D and C, as well as iron, calcium, potassium, phosphorus and zinc! Chickweed has a delicate flavor, much like spinach, and works well when freshly picked and added to sandwiches and salads. If you don’t like the taste, you can still reap the benefits by hiding it in soups and stews. Medicinally, chickweed can be used as a topical treatment for minor cuts, burns, eczema and rashes. It’s also a mild diuretic and is said to relieve cystitis and irritable bladder symptoms. Not just for making daisy chains, the greens and petals of this common garden flower can be eaten either raw or cooked, although some find the flavor a little bitter. Daisies have been brewed into a tea and used in traditional Austrian medicine for gastrointestinal and respiratory tract disorders. They also have anti-inflammatory properties. Unlike its name suggests, the flavor of this plant is nothing like marshmallow. Tea made from common mallow root forms a gelatinous mixture, which is soothing for the digestive and genitourinary tracts. Like many of the other weeds listed, the leaves are better tasting when eaten young and can be cooked in place of other greens. The seed pods are also edible and contain an impressive 21% protein. A nutritional powerhouse, Purslane contains more omega-3 fatty acids than any other leafy vegetable. It’s rich in vitamins A, C, E as well as magnesium, calcium, potassium and iron. In traditional Chinese medicine, purslane leaves are used for insect bites and bee stings, sores, diarrhea and hemorrhoids. With a somewhat sour and salty flavor, it’s an acquired taste, but works great in soups and stews. Try breading and frying the leaves for a tempura style side dish. 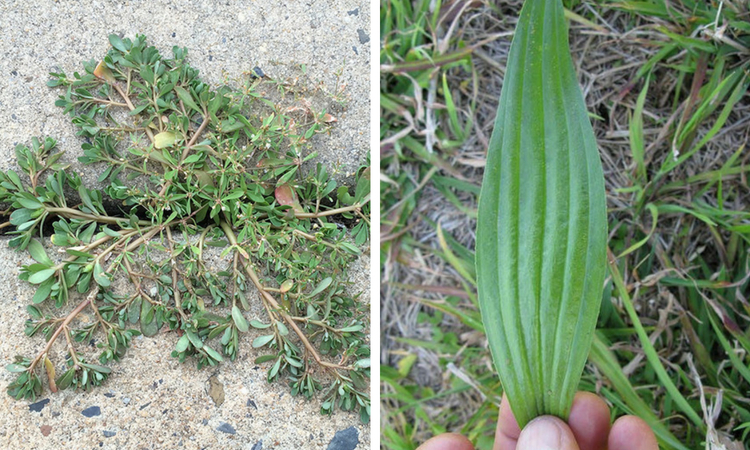 Even though this weed happily grows in sidewalk cracks, try looking for some that’s a little less trampled – you’ll probably find some in your garden. Not to be confused with the banana-like Caribbean fruit, this common weed can be used topically to treat burns, stings and other wounds. While the young leaves are tasty either raw or cooked, the older leaves are a bit tough and unpleasant tasting (but there’s nothing to stop you eating them if you wish). 100 grams of plantain contains the same amount of vitamin A as a large carrot, and is very rich in vitamin B1 and riboflavin. Research shows plantain is beneficial in treating bronchitis, sore throats and cold symptoms. You might have noticed that this pretty pinky-red flower attracts all the bees to your garden. It’s not just a great source of food for them, but also for you! Traditionally used in India for its anti-inflammatory properties, Red Clover has also been used as a folk remedy for cancer. However, as the American Cancer Society states there is no evidence to back this claim up, it’s best to enjoy red clover simply as a source of calcium, chromium, magnesium, niacin, phosphorus, potassium, thiamine, and vitamin C.
Because it’s also a rich in isoflavones, chemicals that act like estrogens in the body, go easy on your intake. Small amounts of raw clover leaves or the flowers can be added to salads, sautéed or pan roasted. Another popular medicinal weed, you’ll require gloves or thick skin when picking this! It’s used for urination problems and kidney stones, joint ailments and as a diuretic. The leaves are also said to help fight allergies and hay fever. Nettles are rich in vitamins A, B2, C, D, and K and have important nutrients like antioxidants, amino acids and chlorophyll. They’re also a good source of calcium, potassium, iodine, manganese, and especially iron. Boiled nettle makes a side dish similar to collard greens and is great when added to omelets. You can also make some delicious dips, teas, soups and pesto.